In Lumberton, and the surrounding so-called Robeson Co., sometimes it’s hard to tell what’s hurricane damage, and what was caused by the preexisting disaster of capitalism. What is inescapable is the visible overlap of both. This is a rural county, and a sprawling one; the poorest in North Carolina, with a median income just barely above the Federal poverty line. If you speak to the locals, people will readily tell you that much of the community still hasn’t recovered from Hurricane Matthew two years ago. Some folks who lost everything during that storm struggled to put their lives back together, only to lose everything again when Florence devastated the area. For them, the need will long outlive the flood, and immediate disaster. This is home to the Lumbee tribe of about 60,000 people, who have made the land along the Lumber River their home for the past 300 years, since moving into the area escaping the brutal, growing threat of the colonialism of the coast. The Lumbee people have been consistently denied federal recognition, though their tribe, and tribal government, are recognized by the state of North Carolina. Though there are many contributing factors in this denial, one especially stands out, and it has to do with a legacy of racist "one drop" policies upheld by the settler colonial government of the United States. If the Lumbee were federally recognized, they would be recognized as the largest tribe east of the Mississippi River. In the immediate aftermath of Hurricane Florence, FEMA, and larger NGOs were nowhere to be seen. This area, and it’s people, were largely forgotten and abandoned. What aid is present has been undertaken on a grassroots level by members of the community, and volunteers working under the banner of Mutual Aid Disaster Relief, many of whom have been in the impacted areas since days before the storm, preparing staging grounds for relief. The solidarity has been beautiful and overwhelming, but the need is even greater than the resources available to those people. Volunteers in this area, locals and travelers, rescued people during the hurricane, and from their flooded homes, on kayaks and canoes, taken supplies to people trapped in flooded homes, and tried to meet the needs of the people who come seeking help. Once the flood waters receded, we began the work of recovery. This has included mold remediation, and gutting, and repairing flood damaged homes, in addition to continuing to provide basic supplies and necessities to people. But in the midst of tragedy, community members, and those coming to work in solidarity with them, would like to see this staging place turn into a community center for long term relief. Some have even said that this whole effort has them thinking broadly, what if we could care for each other like this all the time? We want nothing more than to help turn that community vision into a beautiful reality to benefit everyone in Robeson Co.
Dreaming and scheming and building, as radicals and revolutionaries always do, there have been so many wonderful talks about what this space could mean for this community. These ideas have included, but aren’t limited too, pop up clinics, a people’s school, a food pantry, a shelter, a harm reduction project, and the list goes on. Since the passing of the storm, in addition to rescuing nearly 75 people from flood water, we have given out over 100,000 lbs of supplies directly to the community, passed out harm reduction kits, tarped 10 homes, repaired 3 roofs, and a floor, along with electrical wiring, and an entry door. We have a book of names, addresses, and needs. Needs we need your help to meet. 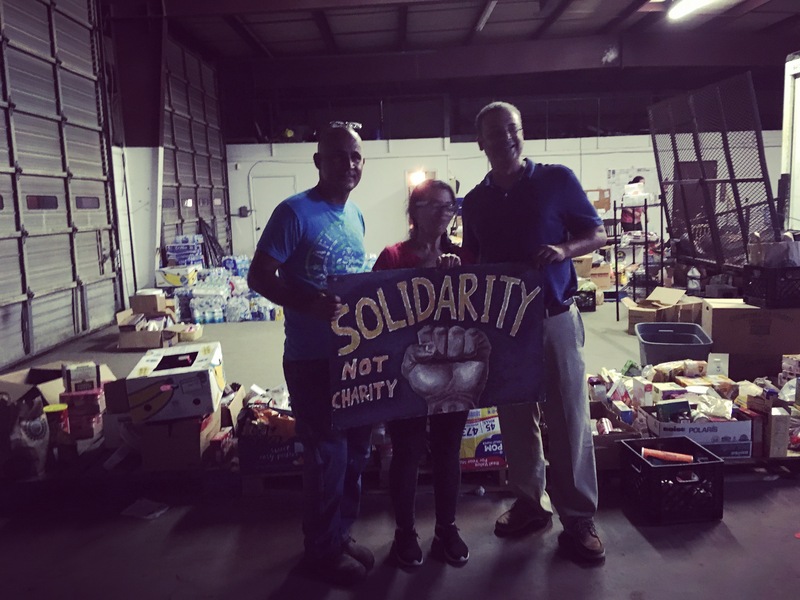 It merits mentioning, that in the middle of their own storm, the people of this community have also sent relief to survivors of Hurricane Michael in Florida. Supplies and monetary donations have slowed down in Lumberton. We believe this can be attributed to media fatigue and everyone moving on, but it’s important to remember that relief efforts take time, rebuilding lives takes time and the need is still very great. We currently have multiple critical projects we are working on, involving gutting flood damaged houses for families, and making the necessary repairs. This is both costly and demands more bodies than we have. People cannot live in mold infested homes. There are children and elders and people with compromised immune systems. The legendary Lakota warrior, Crazy Horse, once said "A very great vision is needed and the man who has it must follow it as the eagle seeks the deepest blue of the sky." We are building power while the lights are out, a power from the inside, outward, and from the bottom upward. And we are following our visions through the deepest blue of the day and all the darkness that surrounds us at night. In moments of tragedy, our hope rests in each other. We know that with any disaster,there will always be flowers growing upfrom the rubble and ruin. We’ve acquired a permanent space that can be used to stage long term relief, and act as the community space people have been dreaming of. But we need all the help we can get, from comrades and friends, with the same heart, mind, and vision. We invite you to join us. We invite you to be part of this work, by donating your resources, your money, your time, your compassion to this community. Even though the flood has passed, the need remains, and the dreams of this county desperately need to be made reality. Saved your payment information with Action Network? Log in now. You may receive updates from Mutual Aid Disaster Relief, the sponsor of this fundraiser.